Zuri has compiled a list of 15 gorgeous designer sarees with a modern twist best suitable for a Bengali bride. My best friend is a Bengali and so I got to attend a wedding full with so many rituals that I have never seen before. From Gaye Holud (Haldi ceremony) to Bou Bhat (wedding reception), the bride looked beautiful in lovely colors and beautiful fabrics chosen sensibly for each occasion. A typical Bengali bride is supposed to be dressed in dark a red Banarasi silk sari on her wedding day however, thanks to Sabyasachi Mukherjee, the famous Indian designer, who has brought such an amazing creative twist! His take on Bengali bridal wear has been acknowledged around the world. The bridal wear is embellished with intricate craft work. His outfits have subtle designs and quirky colors to make the bride look traditionally modern. Even though, red or maroon silk with gold zari (thread work) remains a classic and first choice of a Bengali bride-to-be, however, Zuri brings to you 15 picks infused with novel richness combined with gorgeous artistic twist. 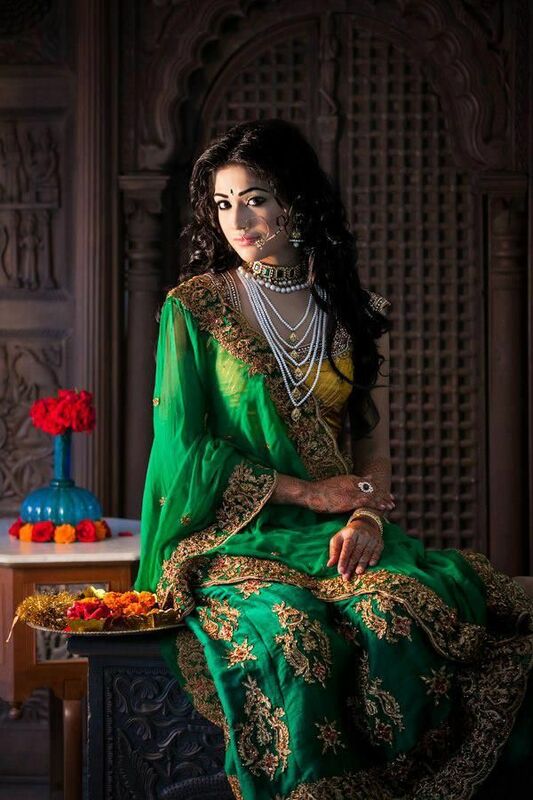 With these ideas, a Bengali bride is bound to look stylish, bright and bold. Golden cream saree accentuated with pearls, peach Banarsi silk with a jacket (or can be flaunted with a halter neck), georgette in cream with gotta-patti or zardosi work, dark green lehenga saree with a yellow blouse in brocade, ink blue and yellow net saree with Swarovski border, an elegant combination of gray and beige nicely done in silk/net/georgette or crepe, orange-red-and-pink silk saree worn traditionally and there is so much more! Beautiful motifs, could be paisleys or lotus flowers, worn with traditional Bengali gold jewelry (pati haar, jhumkis, nath, tikli, tairaa). Oh! I would love to be dressed so beautifully, looking sophisticated, royal and oozing out imperial elegance on my wedding day. As for the makeup, which plays an equally important role, a Bengali bride with her sharp features can play a lot with her eyes. Shades of gold and red in eye shadow, thick eyeliner, kajal to define her big eyes and mascara for the curling effect to compliment her stunning wedding attire. Blush and lipstick chosen carefully to match the outfit (brides mostly stick to red). White and red dots on the forehead, which is a distinctive mark of a Bengali bride and big red bindi! Our bride is all set to steal a few hearts 😉 Dazzling and sparkling all the way to the wedding pandaal, our bride looks so pretty in her designer saree (but ofcourse, with a twist!). Loaded in gold jewels, wearing amazing makeup, looking so calm and majestic.